book on corporate marketing practices, "No Logo: Taking Aim at Brand Bullies," has fuelled this suspicion among civil society organizations. Yet, what not-for-profits are recognizing the world over is that like it or not, they have existing brands and their identity or positioning with external audiences requires attention. 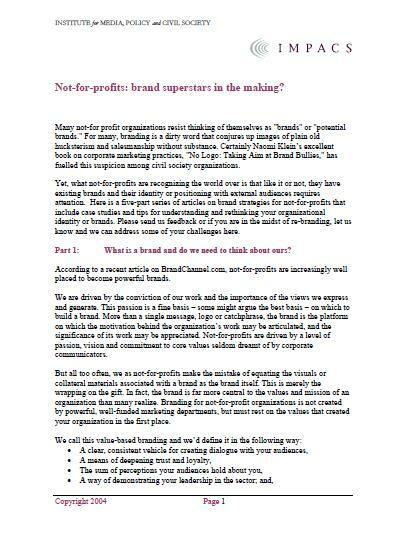 Here is a five-part series of articles on brand strategies for not-for-profits that include case studies and tips for understanding and rethinking your organizational identity or brands. Please send us feedback or if you are in the midst of re-branding, let us know and we can address some of your challenges here.